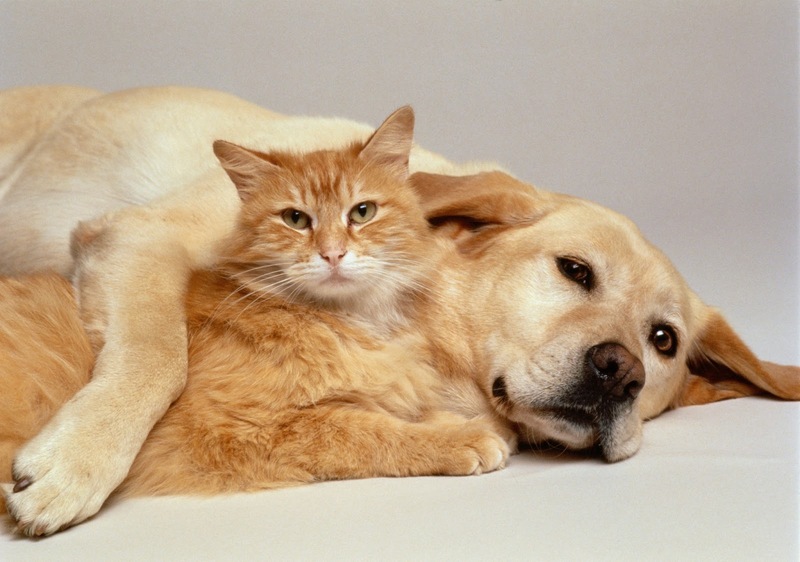 Although the stereotype is that dogs and cats are sworn enemies, many dogs and cats can happily live together. Some can even be friends! In this blog, we will help you learn how to properly introduce your dog and cats, and how to ensure they have a lasting relationship. When introducing a dog and cat, you need to be aware that they will need time to know each other. Dogs who are gentle and do not like to chase small animals will be easier to introduce, but even predatory dogs can learn not to chase cats. The cat will also likely take while to accept the new dog since cats are usually less friendly and more independent. Your cat will be more likely to accept a smaller, calmer dog, but can also learn to accept any type of dog. Dogs who have never lived with cats will usually fall under three types of reactions. Play: If your dog is young and energetic, he may treat your cat like another dog and simply try to play, especially if your cat is curious and brave. This can be the start of a great friendship if your cat plays back, but many cats will react in defense and claw or hiss at your dog. Because cats are generally not as rambunctious as dogs, they may not respond well to the dog’s nipping and chasing. Regardless of how you cat reacts, play between dogs and cats should be closely monitored because most dogs don’t respond appropriately to the cat’s warning signs that she’s had enough. Remember that dogs can hurt small animals without even realizing it and cats can injure a dog with their claws. Although playing can be fun for both animals, it can escalate quickly and should always be monitored. Prey: Some dogs unfortunately view cats as prey, especially if your cat runs when she sees a dog. Your dog may aggressively chase a scared cat and even try to kill her. Cats who have never lived with dogs will only escalate this behavior by running or becoming defensive. Caution/Avoidance: If your dog is older and calmer, and your cat is young and playful, the dog may avoid her or only approach with caution. Try not to let your cat bother your dog and let him come to her on his own time. Caution/Avoidance: Your cat may be scared of your dog and just try to avoid him all together. She may watch from afar and only approach him with caution. Defensive: Cats don’t typically share territory well. Your cat may consider the dog an intruder and react defensively. She will have to establish her dominance before she can accept a new dog. • Before you bring your cat and new dog together, prepare for their first introduction by working with your cat to teach her to redirect her attention to you by calling her name and giving her treats when she looks. Be sure not to punish her if she doesn’t look – this will make her associate her name with punishment. • If your dog is reacting to the cat, distract him by making him sit or lay down. Be sure to give him treats when he is obedient! • Be careful to watch your cat as well as your dog. One well-aimed cat paw with all claws extended can cause serious injury to a dog. • Use the leash to stop any chasing, barking, or aggressive behavior from your dog. You can also ask him to preform simple obedience tasks. Be sure not to yell at him or jerk on the leash as you want the cat and dog to associate each other with a positive experience. Eventually, you should be able to keep your dog and cat in the same space with little intervention. However, it will take time so you must be patient during this process. We hope these tips help your dog and cat have a happy, healthy relationship for years to come!